Every individual living on our planet has a moral obligation and social responsibility to become environmentally conscious. To do so is to work toward a better tomorrow and Green Bag America encourages everyone, including small and large businesses, to engage in environmentally safe business practices. The statistics are alarming; in the year 1960, the United States generated and manufactured nearly 6.3 billion pounds of plastic. By the early 1970s that 6.3 billion pounds had tripled to as much as 18.9 billion pounds of plastic generated! A little more than a decade later in the late 1980s the USA had generated 50 billion pounds of plastic. In 1977, the circulation of HDPE/plastic bags began. Some estimates suggest that on a global scale the world is consuming anywhere between 500 billion and a trillion bags every year. According to the Wall Street Journal the United States of America is using 100 billion plastic bags each and every year which requires some 12 million barrels of petroleum to produce. The heaviest reliance on the use of plastic bags has been identified in the grocery and retail markets. Statistics indicate that 53 percent of all bags are distributed by supermarkets and grocery retailers. While a switch to paper bags means that businesses are offering a product that is a bit more biodegradable than plastic, in truth, the effects on the environment created by paper bag production are equally harmful, if not more so. Plastic and paper production industries are extremely harmful on the environment in numerous ways. Plastic takes forever to decompose and it will never go through the process completely. Essentially, through a process known as photo degradation, plastic will only break down into pieces that are smaller and smaller, but will never disappear. There are no organisms that exist that can convert plastic into anything useful. Thus, the small pieces of plastic left over after the photo degradation process will continue to fill our landfills, our land, our streams, our rivers and our oceans. A survey conducted on the North Pacific Ocean in the year 1998 revealed that a whopping 89 percent of all waste found was some form of plastic or plastic product. Sea life like turtles, dolphins, and whales are being affected by the plastic wastes the world is currently producing. The latter creatures falsely believe that the plastic winding up in the water is actually food and they eat it, only to die incredibly slow and immensely painful deaths. A single family unit of 4 people will actually save 18 plastic bags a week from being used and wasted if they choose to rely on green bags which are reusable products. The savings add up over time: 72 bags in a month, 864 bags a year, and 8640 bags in a decade! Multiply the above figures by a single customer served with green bags and you will see the major strides small and large business owners can help produce in terms of environmental protection measures! 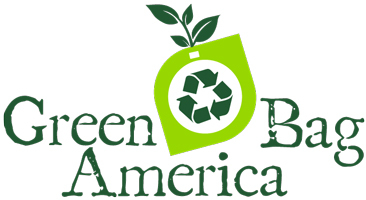 Green Bag America is here to help small and large business owners become part of the solution, to become socially responsible, and to become eco-friendly businesses within the community.